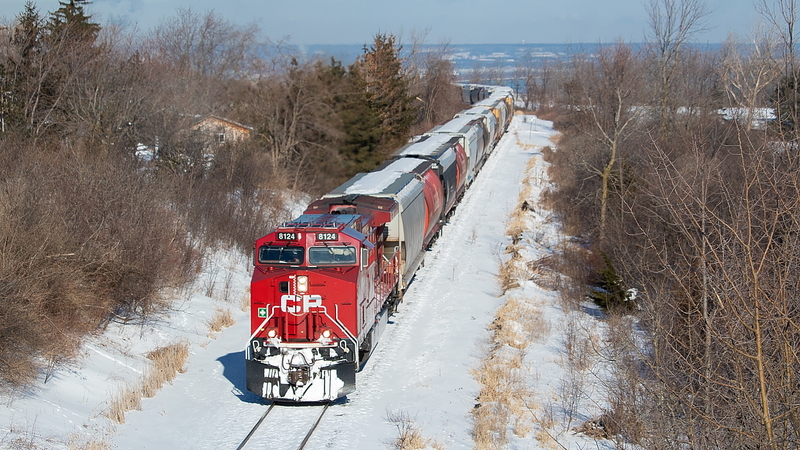 Railpictures.ca - James Knott Photo: How often do you get to see a unit grain train with 82 loaded hoppers and a rear DPU struggling as they crawl to the top of the Niagara Escarpment? Not all that often! What a treat this train was. With the days getting longer, the forecast looking nice for today, and a lot of trains running late lately, I went to bed last night with a hunch I should go check out CP first thing in the morning before work today. My true target was 143, which has been late several times recently, but when I left the house shortly after 6 I heard a 2-246 heading south to Hamilton from Guelph Junction and figured it would have to do. Little did I know that it was a unit grain train (my personal favourite) headed for Welland for interchange with Trillium! In fact, when I was waiting for them in Vinemount, I heard RTC tell 2-246 that TE11 would be taking 30+ of these hoppers over to Feeder later this same day. It is my understanding from what I observed last month in Niagara Region (explained in this shot of CP at Feeder here and Trillium in Port Colborne here), that these CP-interchanged grain hoppers are for the old Robin Hood mill in Port Colborne (someone please correct me if I am mistaken!). The area has changed an awful lot over the years, as exemplified in these James Adeney shots of TH&B rock extras here and here. I was inspired by recent discussion in an Arnold Mooney shot of a TH&B train climbing the escarpment to a try an angle such as the one shown in this Stephen Host Shot, but the early morning sun was at such an angle that it was directly on the nose of the train only through this stretch. | Railpictures.ca – Canadian Railway Photography – photographie ferroviaire Canadienne. Caption: How often do you get to see a unit grain train with 82 loaded hoppers and a rear DPU struggling as they crawl to the top of the Niagara Escarpment? Not all that often! What a treat this train was. With the days getting longer, the forecast looking nice for today, and a lot of trains running late lately, I went to bed last night with a hunch I should go check out CP first thing in the morning before work today. My true target was 143, which has been late several times recently, but when I left the house shortly after 6 I heard a 2-246 heading south to Hamilton from Guelph Junction and figured it would have to do. Little did I know that it was a unit grain train (my personal favourite) headed for Welland for interchange with Trillium! In fact, when I was waiting for them in Vinemount, I heard RTC tell 2-246 that TE11 would be taking 30+ of these hoppers over to Feeder later this same day. It is my understanding from what I observed last month in Niagara Region (explained in this shot of CP at Feeder here and Trillium in Port Colborne here), that these CP-interchanged grain hoppers are for the old Robin Hood mill in Port Colborne (someone please correct me if I am mistaken!). The area has changed an awful lot over the years, as exemplified in these James Adeney shots of TH&B rock extras here and here. I was inspired by recent discussion in an Arnold Mooney shot of a TH&B train climbing the escarpment to a try an angle such as the one shown in this Stephen Host Shot, but the early morning sun was at such an angle that it was directly on the nose of the train only through this stretch.